The decision is just one of the policy changes laid out in the Nuclear Posture Review ordered up by Donald Trump in one of his first actions as president and released by Pentagon officials on Friday. Another is the intent to develop new low-yield, tactical nuclear weapons. Many of the changes are meant to counter Russia’s nuclear weapons development. That includes the new ground-launched cruise missile, said Greg Weaver, the Joint Staff’s deputy director of strategic capabilities. “We need to demonstrate to the Russians that we’re serious about them coming back into compliance with INF and that perhaps they need to be reminded why they signed the INF treaty in the first place,” Weaver told reporters. The U.S. can develop its missile and remain in compliance with the INF treaty unless the weapon is deployed, he said. The cruise-missile project — first reported by the Wall Street Journal in November — allows the U.S. to “prepare for a situation that looks different,” Weaver said. So will the U.S. military deploy the new missile? “Solely doing research on a new missile will keep us within the four corners of the treaty—for now—while also signaling to Russia that we won’t abide by their aggression,” he said in a statement when the Pentagon’s plan was first reported in November. In a series of briefings and interviews in advance of the review’s formal release on Friday, senior defense officials said the document does not call for radical changes to longstanding U.S. nuclear policy and is an appropriate response to provocative actions from Russia, North Korea, China, and Iran. All four are addressed in the report, which spends the most time on Moscow’s nuclear buildup and the U.S. military response. The officials said the changes — including the prospective new missile and low-yield nuclear weapons — will give the U.S. more leverage when negotiating non-proliferation and arms control measure with Russia. Weaver said new low-yield nuclear weapons are needed to counter similar Russian weapons. Without new U.S. low-yield weapons, defense officials said, Russia might feel emboldened to use tactical nuclear weapons without fear of retaliation since American nuclear response options would be constrained to the far more powerful warheads atop land- and submarine-launched ballistic missiles. So the review calls for reducing the warhead yield on a small number of already deployed, submarine-launched ballistic missiles and then developing a new sub- or ship-launched cruise missile. These weapons would give the U.S. another way to respond to a Russian use of a low-yield nuclear weapon without having to send American bombers or fighter aircraft into enemy airspace to drop lower-yield air-launched bombs and missiles, these officials say. Arms control advocates disagree, as do 16 Democratic senators who sent Trump a letter urging him to reconsider the NPR’s stance on low-yield weapons. Robert Soofer, deputy assistant secretary for nuclear and missile defense policy, in an interview with Defense One — and a separate briefing with reporters in advance of Friday’s release — argued the review did not present radical changes, but instead largely continues longstanding nuclear policies embraced by Democratic and Republican administrations alike. “I think there’s a lot more continuity and I think that this document represents the traditional approach that we’ve had to nuclear policy, which is a combination of nuclear deterrence and reducing dangers through arms control and nonproliferation,” Soofer said. 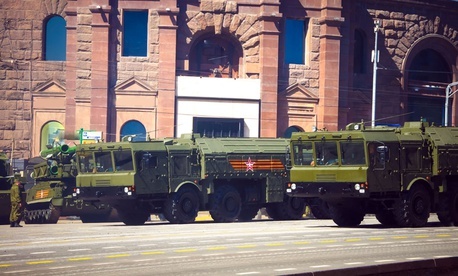 Soofer said that the global security environment has shifted since 2010, when then-President Obama ordered up the last such review, particularly Russia’s modernization of tactical nuclear weapons and simulating their use in exercises. He also noted that the Obama administration had blessed a full modernization of the nuclear triad, and had launched the development of a new stealth bomber, a new ballistic-missile submarine, and new land-based ICBMs. A leaked draft of the review suggested that nuclear weapons might be used to respond to a cyber attack, a policy option Soofer said was not included the final version. “Were Russia agree to agree to return to verifiable arms control measures, to redress the imbalance in non-strategic nuclear forces, the U.S. might agree to limit or forgo acquiring a nuclear [surface-launched cruise missile],” Weaver said. He said the new tactical nuclear weapons will not lead to an arms race. “Reducing Russian confidence in their strategy doesn’t require NATO or the United States to match Russian non-strategic nuclear capabilities in either quantity or diversity,” Weaver said. The review does include nods to efforts to curb non-proliferation and discuss future arms-control agreements. “The only way to get their attention, the only way to get them to come back to the negotiating table, is to start deploying these capabilities,” he said. Caroline Houck contributed with reporting to this article.